Paul Young aka @DogICUma is releasing the results of the SPLIT trial in Berlin, right now, in Berlin at the European Intensive Care Society meeting. I was lucky enough to meet Paul at SMACC in Chicago and we talked then about what it might show. My feeling was very much that balanced solutions make more sense physiologically and whilst he agreed with this he made me stop and think that things were not quite so clear cut. We really do need a trial to help answer this question and that is what the SPLIT trial has done. The full paper is published in JAMA and you can see the abstract below. As always – read the full paper before changing your practice. This is a randomised controlled trial, but it is a slightly unusual design in that ICUs involved in the study changed their protocols every seven weeks. They were either using saline as their base fluid or plasmalyte 148, although they did not know which at the time. So this was a prospective, multicentre, randomised, double-blind crossover study. We’ve not seen many of these at St.Emlyn’s, but the design is fit for purpose. 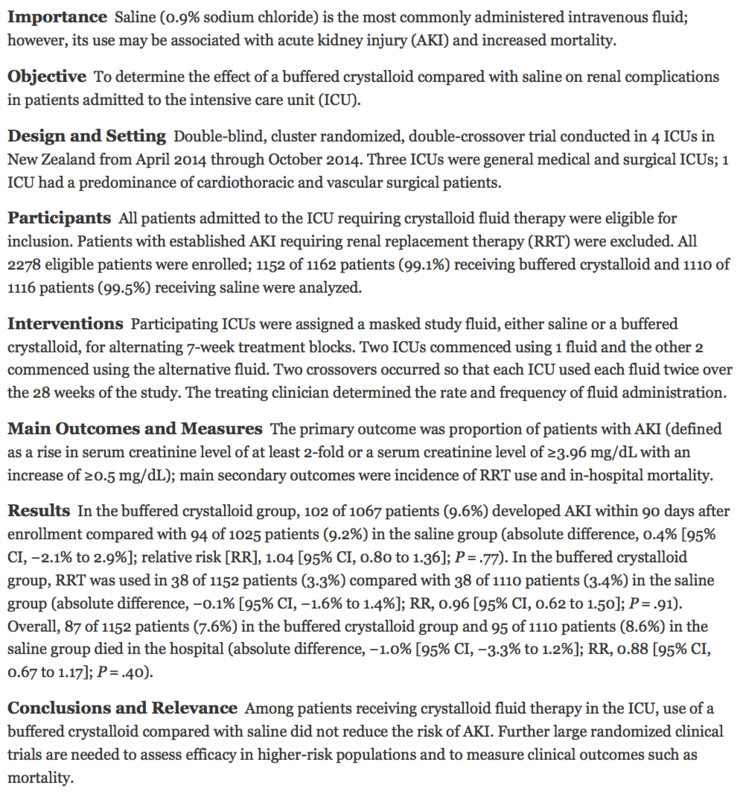 These are ICU patients who required crystalloid fluid therapy in the ICU, except those expected to require renal replacement within 6 hours of admission, those on dialysis or those admitted for palliative of organ donation care. It’s still a pretty broad group of patients and relevant to most ICUs. Patients were followed to hospital discharge, death or to a 90 day censoring point. The primary outcome was the development of acute kidney injury using predefined criteria. Secondary outcome sof creatinine change, renal replacement requirements, mechanical ventilation, length of stay and all cause mortality were also examined. If you are interested in trial design then it’s really interesting to look through the data analysis plan which you can find here. It clearly shows how the authors intended to analyse the data in advance. There is no post-hoc stats wizadry here. This is exactly how the data should be planned in advance so that it is clear to all what happened and what the results truly mean. In summary they found little difference between the two regimes. The incidence of acute kidney injury, renal replacement therapy and all cause mortality were not statistically different. Kirsty Challen has produced a great slide of the main findings. For ED physicians there is a problem here as this population is not the same as our typical patients in the ED. We will therefore struggle to draw too many conclusions for many of our patients, but for the sickest individuals who are heading to the ICU it would seem valid to apply this evidence to that group. So does it really not matter? The authors point out that the study is not really powerered to detect mortality differences nor to determine differences in mortality. There may be important differences, but this trial is too small to demonstrate. They also point out that many patients had fluids (mostly balanced fluids) before they arrived in the ICU, and that was most commonly saline. Perhaps an institutional approach rather than a departmental one may have given a different answer. We also don’t know about other fluids such as Hartmans (which we use a lot of in Virchester) as that was not trialled in this study and we should not infer that plasmalyte is the same as every other balanced solution. Remember – fluids are drugs and we should be cautious and wise in their use. In summary, the current evidence suggests that there is little difference between saline and plasmalyte on the ICU. What that means for the ED and in other service we don’t know, but on balance I think I’m going to stay balanced. Paul Young, the lead author disagrees, he’s going to stick with saline. Next: Next post: JC: The last breath for apnoeic oxygenation? Great summary Simon – but there is a typo – in fact the majority of preenrollment fluid was buffered crystalloid. Another limitation is that all buffered crystalloids may not be equal – what if CSL/ Hartmans was used instead of Plasmalyte? For the first 2L of IV fluid, i think is reasonable to use whatever is cheapest and available in most cases, whether that be saline or a buffered crystalloid. However, even these volumes are still quite small compared to the amount that we would normally give in the ED for resuscitative purposes and the risk of fluid overload, acidaemia and hyperchloraemia from this is unlikely, sparing the kidneys from these insults. Very interesting to hear your opinion Simon. Do you really believe the weight of evidence is compelling enough to demonstrate superiority of balanced solutions? This seems like the first proper blinded RCT in a attempt to answer this question in a vulnerable patient group – and it was negative! The argument that the quantum and type of fluid received in the ED would impact ICU patients who received up to a another seven weeks of fluid seems weak. Generally the most critically ill patients are most sensitive to mismanagement than well patients because their physiology is the most precarious. Give anything to a well patient and they come out of it regardless. I think there are too many confounders in the previous Yunos & Bellomo study to make a firm conclusion. If anything, that paper suggests that there is no such thing as a dangerous drug. Just a dangerous prescriber.